Did you love reading Choose Your Own Adventure books as a kid? (Did you know Netflix made TV adaptations?) Do you dream of being a published author someday? Are you procrastinating? 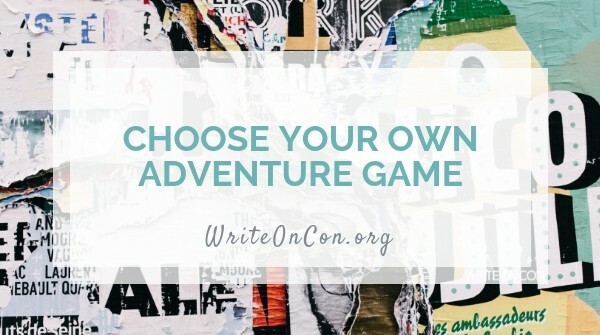 Then let’s have fun with this Choose Your Own Adventure-inspired game simulating your writing journey! Do you have what it takes? YOU are a WRITER. You have a fire in your heart, an idea in your head, and a dream to see your book on shelves someday. But first things first: you have to write it. You sit down at your computer. If you decide to ROLL UP YOUR SLEEVES, GRAB YOUR FAVORITE WRITING SNACKS, TRUSTY PLANNER, INSPIRATIONAL MUGS CLOSE AT HAND, AND BANG OUT SOME WORDS, scroll to “You Wrote a Book!”. If you decide to STARE AT YOUR SCREEN, WHICH TAUNTS YOU WITH ITS BLANKNESS, JUST LIKE JODY WELLS FROM HOMEROOM TAUNTED YOU WITH HER PHYSICAL PERFECTION — IN STARK CONTRAST TO YOUR OWN — AND HER TONGUE OF ACID, scroll to “Staring at the Screen”.If you decide to CRY, scroll to “The Road”. Wow! Look at all those words you banged out! Pat yourself on the back, you! Now you have a finished book on your hands. It’s time to get published!You revise your book, perfect your query letter, take a deep breath, and send it to agents. But months go by, and you don’t get any offers of representation. Now what?If you decide to CRY, scroll to “The Road”.If you decide to WRITE ANOTHER BOOK, scroll to “The Sea”.If you decide to GIVE UP ON WRITING AND BECOME A HERMIT, scroll to “The Forest”. You stare at the screen, as if the words will magically write themselves. Narrator voice: The words do not write themselves.If you decide to ROLL UP YOUR SLEEVES, GRAB YOUR FAVORITE WRITING SNACKS, TRUSTY PLANNER, INSPIRATIONAL MUGS CLOSE AT HAND, AND BANG OUT SOME WORDS, scroll up to “You Wrote a Book!”.If you decide to CRY, scroll to “The Road”. You are DESPONDENT. You WEEP, filled with DESPAIR. Then you feel the wind on your skin, and when you turn around, you see a MYSTERIOUS FIGURE. Whoa. You don’t remember being at a CROSSROADS. The Mysterious Figure introduces himself as “Old Scratch”. He offers you the same deal he made with Dr. Faustus, with Robert Johnson: greatness. Your book will be published; it will be a bestseller and make numerous “Best of” lists. All he asks for is YOUR SOUL.If you decide to SELL YOUR SOUL, scroll to “You Sold Your Soul”.If you decide to DECLINE THE DEVIL’S OFFER, scroll to “I’m a Goody-Two-Shoes (Version 1)”. Determined that THIS will be the book that gets you published, you book yourself a month-long stay at a resort by the sea.You arrive at the resort, favorite writing snacks and trusty planner and inspirational mugs in your luggage, determined. But before you can check in, you see a CLASSIC CONVERTIBLE drive past you along the beach before crashing into the ocean!If you decide to GO OVER AND SEE IF ANYONE IS HURT, scroll to “The Car”.If you decide to CHECK IN, scroll to “The Resort”. The mysterious figure shrugs and disappears. You find yourself back in your room — along with 27 excited messages from your critique partner. Their book sold! You’re in shock, as they haven’t even found representation yet. When they hit the New York Times bestseller list the next day, you realize with horror: they took Old Scratch’s deal. Seeing the success that could have been yours, you become overwhelmed with despair.If you decide to KEEP WAITING, scroll to “Six Months Later”.If you decide to WRITE ANOTHER BOOK, scroll up to “The Resort”.If you decide to GIVE UP ON WRITING AND BECOME A HERMIT, scroll to “The Forest”. You find the DRIVER, still alive but badly injured. To your shock, you recognize her — she’s a CELEBRATED AUTHOR! She begs you to call for help, saying she just finished writing her masterpiece. You spot her manuscript on the passenger seat.If you decide to CALL FOR HELP, scroll to “I’m a Goody-Two-Shoes (Version 2)”.If you decide to PUSH HER INTO THE OCEAN AND STEAL THE MANUSCRIPT, scroll to “Fame and Fortune”. You check into the resort, and for the next month, you write from sunup to sunset, only stopping to eat, sleep, and periodically feel bad about the fact that the person who crashed their car into the ocean drowned because of your selfish actions. Finally, when the month comes to an end, you have it. The book of your heart.You celebrate with a glass of wine in the resort restaurant, newly invigorated, so much so that you don’t even feel guilty anymore. But then alarms start blaring: it’s a TSUNAMI WARNING!As everyone screams and runs for the exits, you realize — oh no! Your computer — with your manuscript that you forgot to back up — is still in your room!If you decide to RETURN TO YOUR ROOM TO SAVE YOUR BOOK, scroll to “Your Room”.If you decide to RUN, scroll to “The Tsunami”. After six months of rejections, you shelve your manuscript. Then you write another book and query that one. That one also doesn’t sell. You write another, and then another after that, and eventually, you get published. It doesn’t become a bestseller or anything, but you’re proud, as you should be. You disappear into the forest, where you live out the rest of your days in solitude. Years later, after you die, your niece Jaycee treks into the woods to sort through your belongings. She is shocked to find your manuscript. It is published posthumously and becomes a bestseller and modern-day classic, and there is much lamentation that you never wrote anything else. You sell your soul. As promised, you become a bestseller. You spend the rest of your days in fame and luxury until you die and are dragged down to the depths of Hell. Because of your heroic actions, the beloved author is rushed into the hospital in time and survives her injuries. Grateful, she stalks you on social media and discovers you are an aspiring writer. She recommends you to her editor, and you get a book deal! But even with her retweeting for everyone to pre-order your book every day until it starts to annoy even you, it doesn’t become a bestseller or anything. You finally realize that the real dream come true is the friends you made along the way. You query her manuscript as your own, and it gets published. You become a bestseller! Unfortunately, the author’s legion of devoted fans soon notice that this new book is awfully similar to her previous writing, and when her body is discovered washed ashore, it doesn’t take long for the authorities to figure out what happened. You are arrested for murder, found guilty, and sentenced to life in prison; as you are escorted from the courthouse, the beloved author’s fans surround you and pelt you with vegetables. But you did, technically, succeed in getting published! Like a salmon swimming upstream, you run in the opposite direction from all the other resort-goers trying to flee and back to your room at top speed. Your laptop! It’s still there! You grab it, but then the water hits. You look out the window and see a mob of people running past. You scream for help, but they all ignore you and keep running. You drown, which, if you think about it, is kind of poetic justice. You’re almost out the door when you see a child trip! As the child screams for help, you’re suddenly overwhelmed with guilt. You dive into the tsunami to save the child, just as a middle school beach volleyball team and their coach run past, filming the tsunami and uploading it on Snapchat. They capture your heroic actions, which go viral. You write a book about the experience, and it becomes a bestseller! Let us know how your adventure went. Leave us a comment or share via your favorite social media platform using #WriteOnCon!